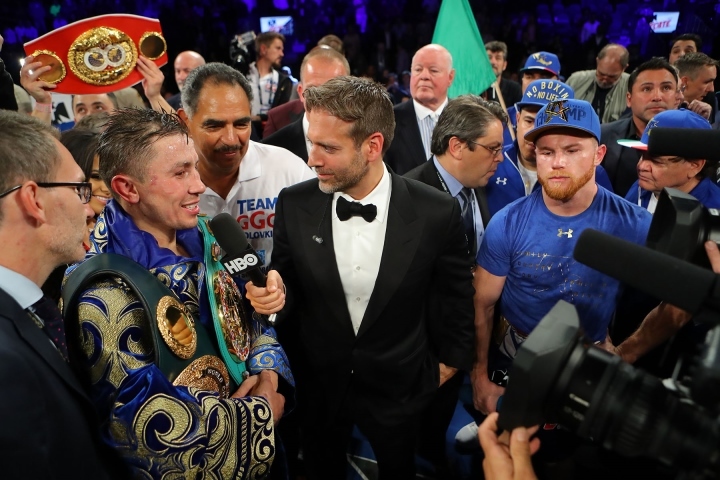 Tom Loeffler, promoter of WBC, WBA, IBF, IBO middleweight world champion Gennady "GGG" Golovkin (37-0-1, 33 KOs) is feeling positive vibes about the possibility of a direct rematch being finalized against Saul "Canelo" Alvarez (49-1-2, 34 KOs). Back in September, Golovkin and Canelo fought to a twelve round split draw at the T-Mobile Arena in Las Vegas. There was a lot of controversy over the scoring, which promoted the WBC to order a direct rematch - clearing the way for Golovkin's side to negotiate the terms without worrying about a potential mandatory defense against Jermall Charlo, who won a final eliminator a few months ago. At the WBC's 55th annual Convention, being held at Flame Towers, Fairmont Hotel, Baku, Azerbaijan, Loeffler remained optimistic, but also realistic about the task ahead. The two sides are talking, but Loeffler cautions that anything can happen. Canelo has no intention of fighting any sooner than Cinco De Mayo weekend, so the two sides are targeting an HBO Pay-Per-View date of May 5th - with Las Vegas once again being the frontrunner to host the anticipated contest. "We still have to work out the details. There's no guarantee they will get in the ring - but I've got a good feeling about it. Golden Boy wants to do it, HBO wants to do it, and the fans want to see the rematch," Loeffler said. "Everything I've heard is that Canelo doesn't want to fight until before May, so that is part of a concession on Gennady's side, as Gennady would like to fight sooner than May. But Gennady's agreed that if we can do the rematch directly, he'll wait until then. [QUOTE=A.K;18114077]Biggest jab output and landing in the sport and he's not that good with the jab huh?? People say some dumb **** when they hating[/QUOTE] What in only one fight against lemieux that's it! Dumb people repeat jim lampley. [QUOTE=aboutfkntime;18114905]sig right there, lookin for a good home[/QUOTE] Sig worth stuff. [QUOTE=twosweethooks;18114113]Great fighters fight often and don't wait til others get OLDER[/QUOTE] So Mayweather wasn’t great?